Well eventually this should go in the manual as well, but it's easier to answer questions and such here so I'll start here with the basic stuff and maybe someone can take screenshots and such for the manual. First off the basic status, I have been testing this myself, but I would imagine it's going to take a couple revisions to get everything working properly for everyone so report problems when you find them. There are also still some card images missing, I think I got the common ones in but if you try and use a card that doesn't have an image yet it will just refuse to go in your deck, this isn't a bug, just means I haven't finished that image yet. Will let you know when they are all done and at that point you can report any individual cards that don't work. So here's how a round will work. The play cards link will bring up a list of people in the current town you can challenge to a game. It opens in the popup window so you can continue to work on whatever task you're doing in the background, but you will need to keep an eye out for botchecks behind. 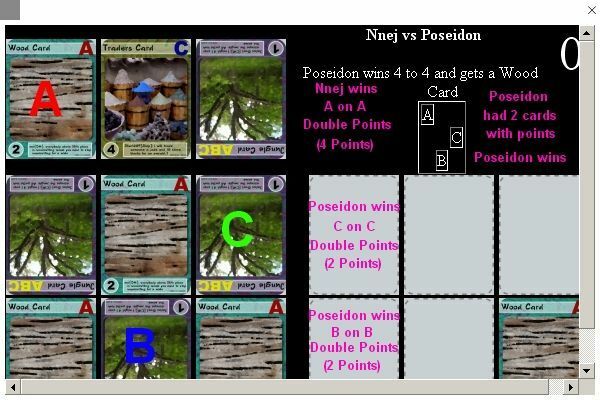 Each player will need at least 6 cards, once the challenge is accepted you will see the card screen. To the left is the playing area and to the right is your deck. To start with you can choose 6 cards from your inventory and click on them to add them to your deck. Then you will be given a form to select select letters for either the rows or columns of the board, one player labels the rows and one player the columns without the other player seeing. 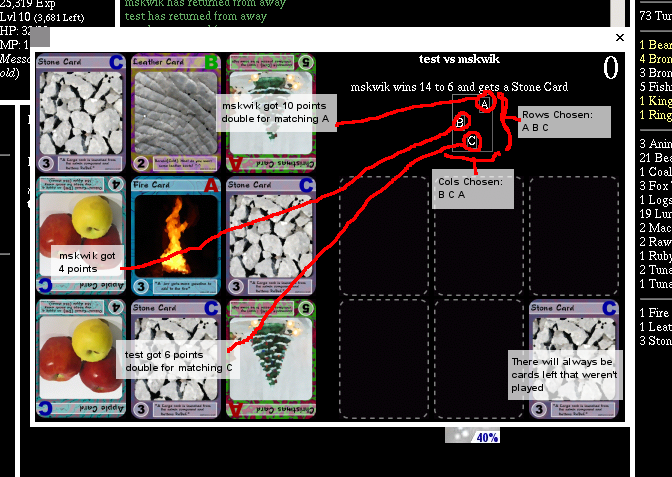 Then players take turns placing cards by clicking the card in their deck and then the spot they wish to place it, following the directions to see whose turn it is. At the end the scoring is done as follows, each players rows and columns are combined to choose 3 squares where the letters match. 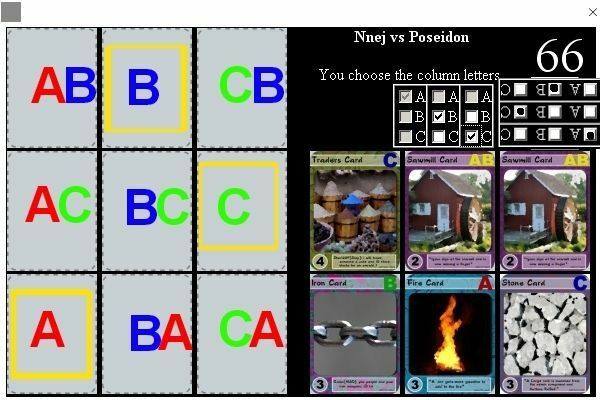 Those 3 cards are scored to the person who placed them, at face value if they do not match the letter for the square and at double the value if the letters do match. The player with the higher score is the winner, or in the case of a tie the player with more cards selected. The winner then gets a random card from the original deck of the loser, not from their inventory or from the cards played, but from the original 6 cards chosen. If that wasn't completely clear perhaps trying a few rounds will help, the outcome seems somewhat random at first but there does seem to be a bit of strategy once you get used to it. We'll give it a try with more people and see if any problems come up, so far it seems to be balanced fairly well in testing. The basics of the whole game is that you have to imagine the board as a grid. 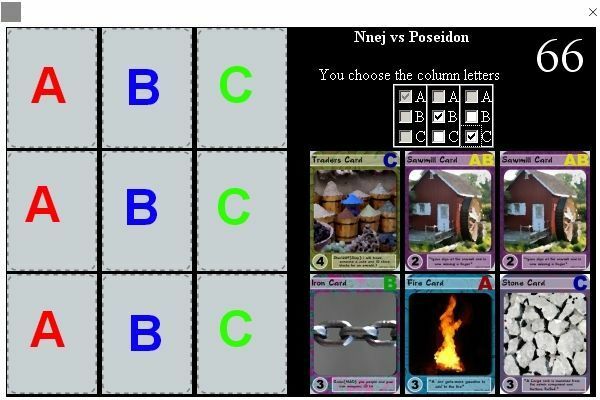 Now, you notice how your cards have letters on them, such as A, B, C, AB, BC, etc. When you start the game you either pick rows or columns. The challenger always picks columns and the person challenged always picks rows. You choose which letters go in which row/column. The ONLY spots on that board that count are the AA, BB, and CC spots. If you put a card that has an A, AB, AC, or ABC on the AA spot, you will get double points for that spot, because you are putting a card with an A on the AA spot. The points are determined by the number on the card. So if you put a 6A on that spot you will get 12 points. However, if you put a B, BC, or C card on that spot you will only get face value points for that card. So if you put a 4B down you will only get 4 points. In case of a tie, the person who won 2 spots wins. So if I get 4 points and I only won the AA spot but someone else gets 4 points and they won both the BB and CC spot then they win.